Microsoft jumped into hardware in a big way with the first Surface Pro back in 2013, and the line-up of premium Windows devices has consistently got stronger and stronger since then, expanding to include laptops and even all-in-ones as well as the original 2-in-1 tablet/laptop hybrid. The only difficulty is in picking which one is going to be your next computer – Pro, Book, or Studio? We've examined all the spec sheets on the devices Microsoft is selling direct right now to help you make an informed decision. 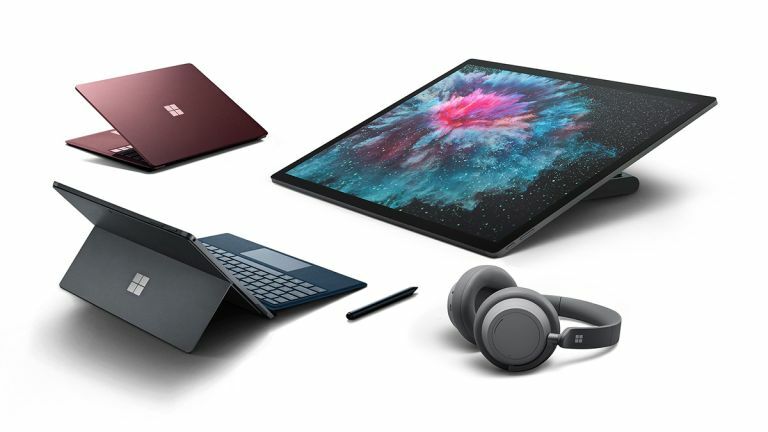 It's hard to pick a "best" Surface when everyone's looking for something different and working to a different budget, but we went ahead and did it anyway – the brand new Surface Pro 6 is our top choice, offering plenty of flexibility and a 2-in-1 form factor... as well as a new black finish. You can configure the latest 12.3-inch Surface Pro in all kinds of different ways depending on your needs and budget, and at the premium end of the scale you've got an Intel Core i7 processor, 16GB of RAM, and a 1TB SSD hard drive. That's basically going to be able to cope with whatever you throw at it. And despite those high-level specs (if you want them), the Surface Pro remains eminently portable. Use it as a tablet (with the option of the Surface Pen stylus), use it as laptop with a Type Cover, or prop it up and watch movies on it. If you absolutely want the best laptop that Microsoft makes, the Surface Book 2 is it, but you'll have to pay for the privilege of owning one. Even at the lowest configurations, this machine is going to set you back a fair chunk of cash. But what a machine – a gorgeous, high-resolution 13.5-inch or 15-inch touchscreen display, a ton of battery life, a choice of high-end Intel chips, plus integrated Nvidia graphics that let you run your games, video editing software, and virtual reality apps with ease. It's a beast of a Surface computer. The detachable screen means you can even use it as a tablet, albeit a chunky tablet that loses some graphics power and some battery life once it's detached from the keyboard. If you can afford it, you won't be disappointed. The Surface Laptop 2 is a fine upgrade on the original. You don't get the power or the versatility of the Surface Book 2, but considering its lighter weight and its lower price, it may well be the best bet for the majority of users out there. As usual, you've got a choice of configurations to pick from: you can go up to an Intel Core i7 CPU paired with 16GB of RAM, so this is a laptop that's capable of some serious power (if you can afford it). Storage tops out at 256GB though, at least in the configurations available at the time of writing. While you can get similar specced Windows 10 laptops for less elsewhere, the Surface Laptop 2 is an excellently designed computer that's made to last. If you don't need the option of a tablet form factor, go for this. Right in the middle of our list is the Surface Go: like the Surface Pro, it can switch between a tablet and a laptop with the help of a keyboard attachment, but it has a smaller 10-inch screen, more modest specs, and a lower price. So, depending on your needs, it might be a better or a worse option for you compared with the other Surfaces. It still runs full-fat Windows 10 and will cost you less than some of the other options, but it won't cope all that well with very demanding tasks or games. RAM goes up to 8GB and storage goes up to 128GB, and there's an Intel 4415Y chip inside. With that in mind, it's perhaps more of a rival to the iPad Pro – an alternative to consider if you prefer Microsoft's OS to the one made by Apple. Last year's Surface Pro 2017 definitely shouldn't be discounted from your shopping shortlist: it was our top pick last year and still has a lot going for it. The screen is excellent, the battery life impresses, and it works as both a laptop and a tablet. As with the newest Surface Pro 6, you've got a choice of spec combinations to pick from, but there are more limitations now. Shop around and you should be able to find both low-end and high-end configurations. Even if it is last year's hardware, it was a premium machine when it first launched, so still holds up well today. The big advantage over the new Surface Pro 6 is going to be the cheaper price, so look out for deals. Microsoft's new and upgraded Surface Studio 2 is an even more impressive machine than the original, with better internal components alongside improved 28-inch, 4,500 x 3,000 pixel display, which again can be laid almost flat to work with the Surface Dial or the Surface Pen. At the time of writing the Surface Studio 2 hasn't yet gone on sale, but we're expecting it to appear any day. You can go all the way up to an Intel Core i7 chip and add in some impressive graphics on top, for all your creative design needs. So with all that power, why is it so low down in our list? Well, price: you're going to have to pay an awful lot for this computer, and for the same money you can pick up many better-specced Windows 10 machines. For the Microsoft loyalists and the very wealthy only. The original Surface Laptop now has a successor, but this is still worth a look – you're basically getting hardware that's a little more dated, but you'll be paying less too, so if your needs aren't too demanding then it might be perfect. Other factors in its favour are its thinness, its lightness, and its portability. If you need something that's going to last a long time on the move and isn't going to weigh down your backpack, consider the older Surface Laptop rather than the newer one. The configuration options are more limited on last year's model, but you can still get up to 16GB of RAM with an Intel Core i5 processor, plus 1TB of storage space, so that's still a very capable computing device.